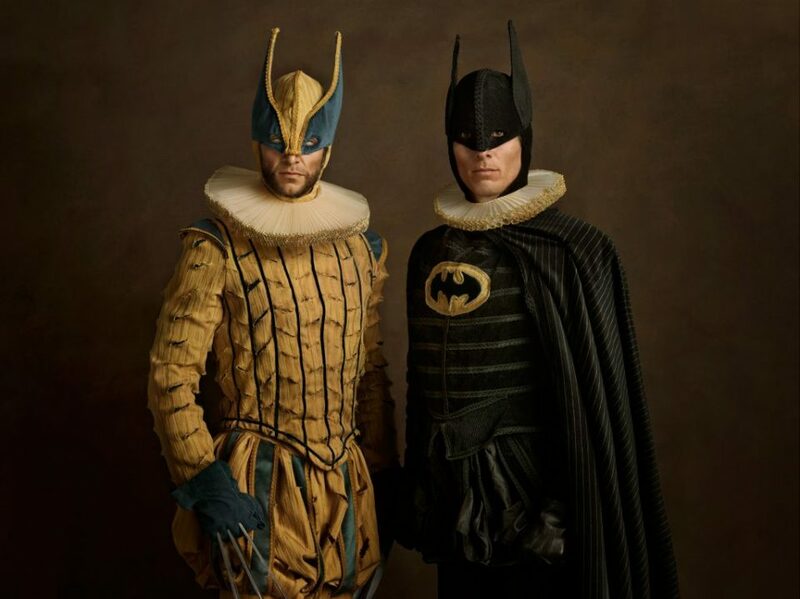 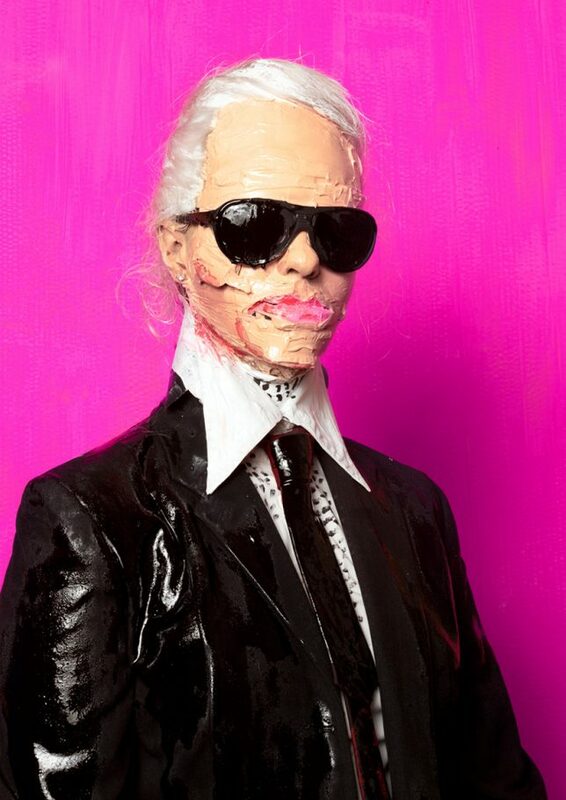 In centuries past, art has mostly depicted religious and political figures alongside artist’s models and ordinary people, but as future generations look back on our era, they’ll see a confusing mishmash of celebrities and fictional characters interwoven into our fine art legacy. 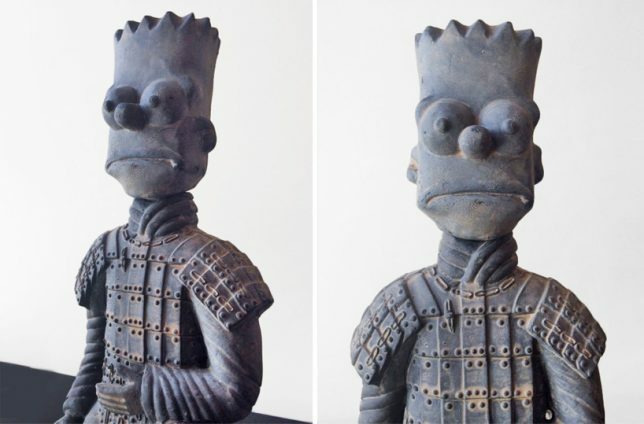 Often removed from their context and mixed together, figures from music, movies, television and comic books presented as art subjects make a statement on our obsession with image, fame, heroes and the qualities we project onto the most famous faces our culture has created. 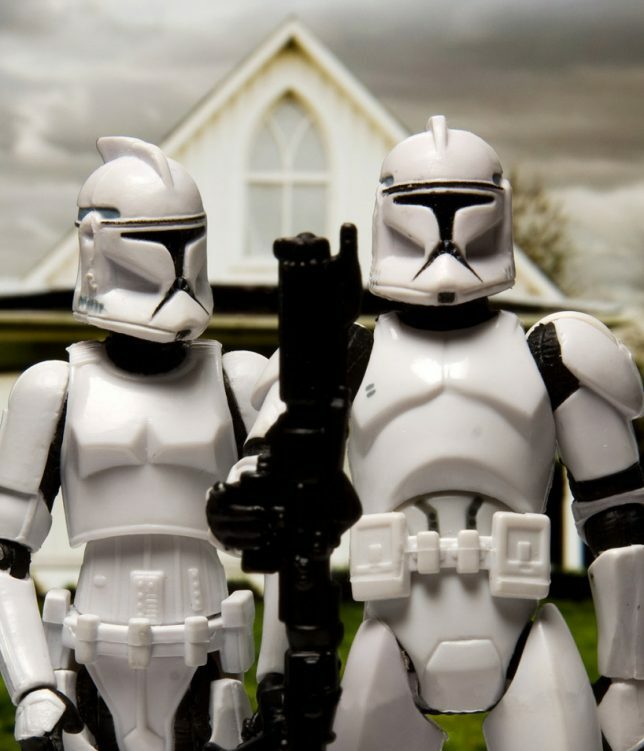 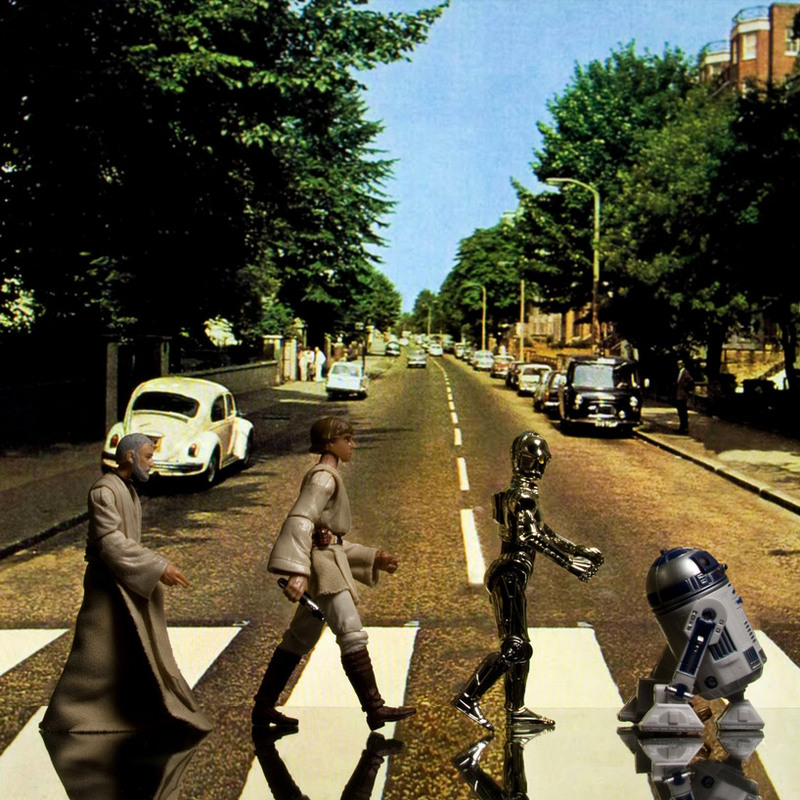 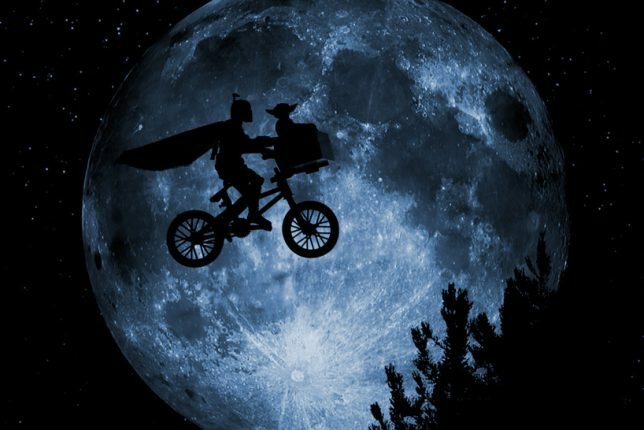 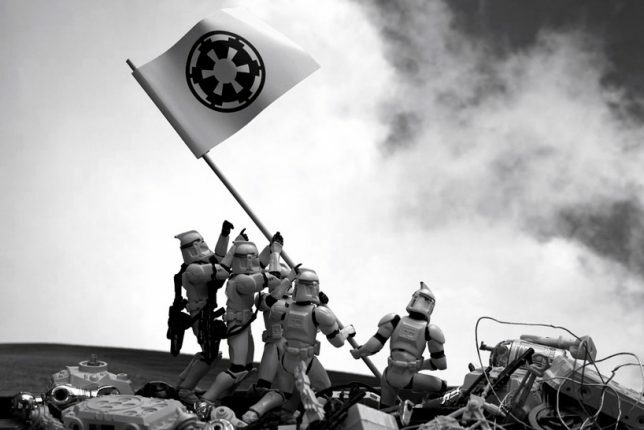 For ‘365 Days of Clones,’ Canadian art teacher David Eger recreated famous photographs using Star Wars figurines, including play son ‘Raising the Flag on Iwo Jima,’ ‘Abbey Road,’ ‘American Gothic’ and even the iconic flying-across-the-moon-on-a-bicycle scene from E.T. 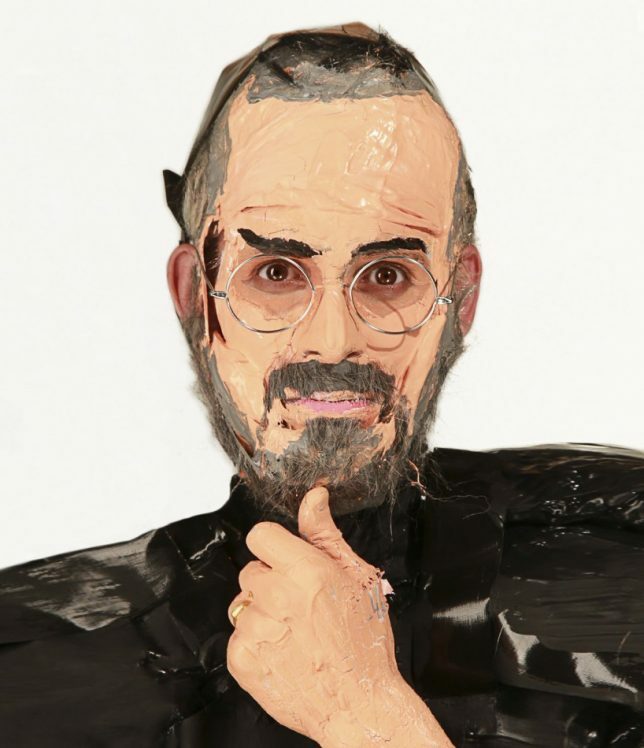 Models are used as the basis of living sculptures, their features changed with globs of paint, plastic, paper, clothes and wigs so they roughly resemble celebrities like Karl Lagerfeld, Steve Jobs and Pamela Anderson. 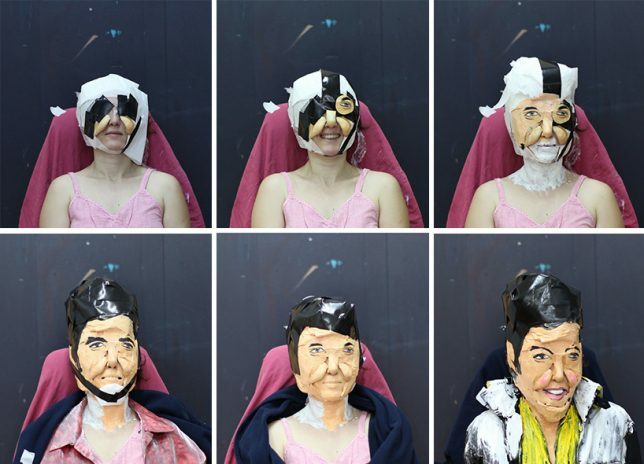 Artist Marie-Lou Desmeules refers to her creations as ‘pop zombies,’ asking viewers to consider what these artistic impersonations say about image in our society. 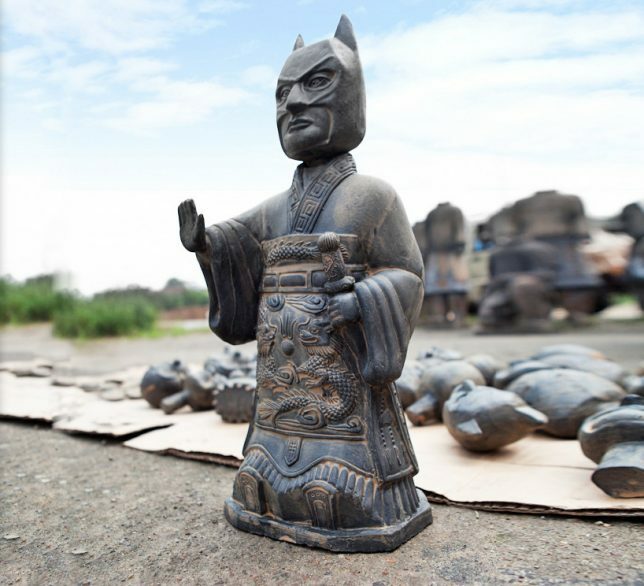 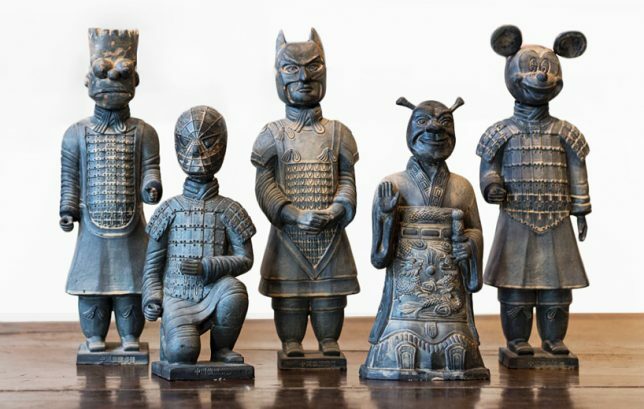 Rather than the nameless soldiers of old who made up the historical Chinese terra-cotta army, the Xi’an-American Warriors by Lizabeth Eva Rossof bear the faces of Spiderman, Bart Simpson, Batman, Shrek, Mickey Mouse and other fictional characters, reflecting both the far reach of America’s media influence and modern-day China’s industry of counterfeiting these copyrighted properties. 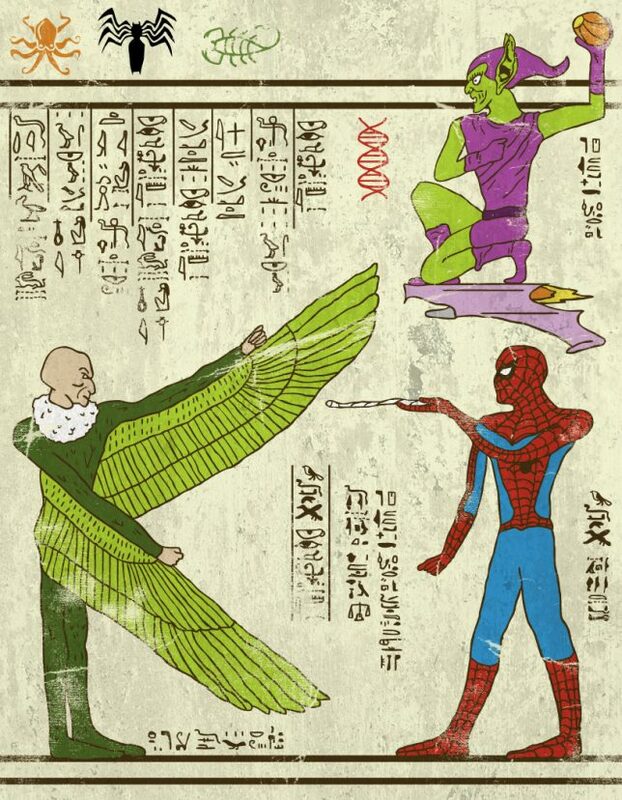 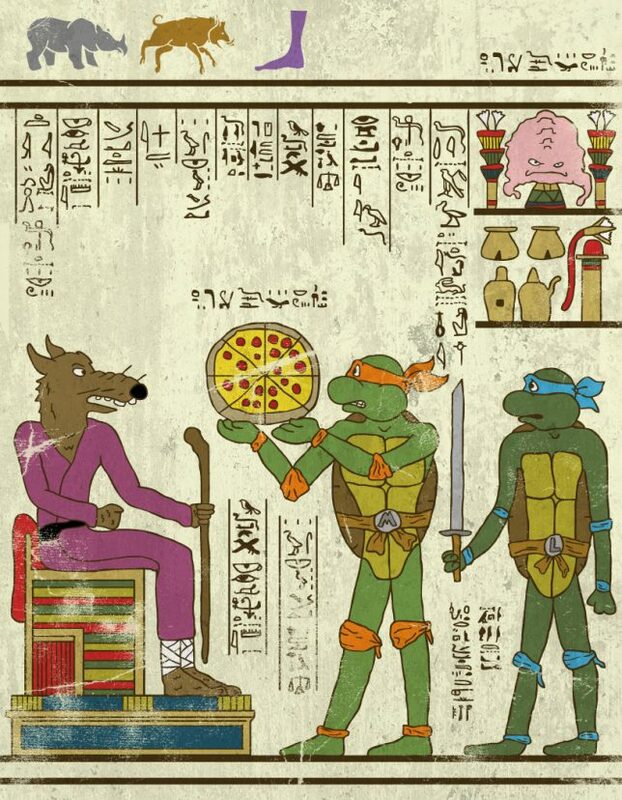 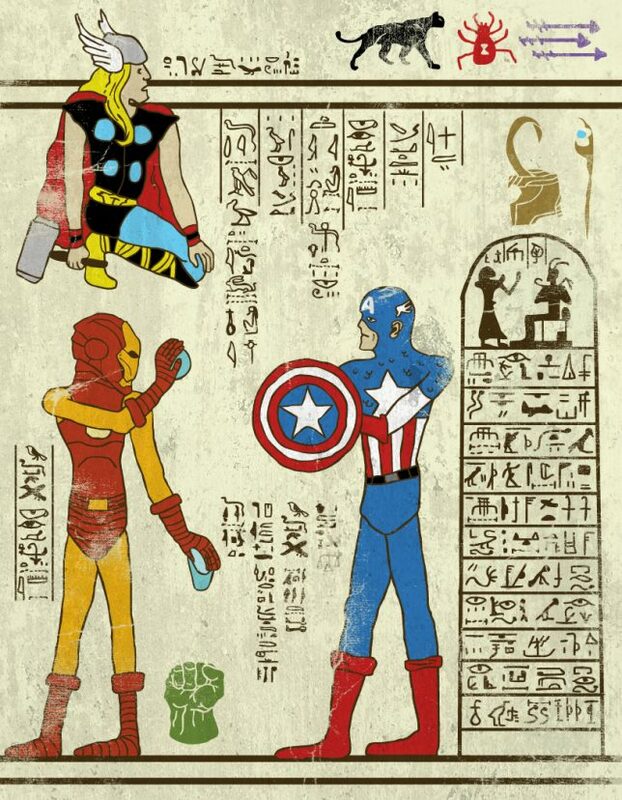 In ancient Egyptian hieroglyphics, artist Josh Lane saw a graphic style of art that lends itself surprisingly well to modern-day cartoon and comic book styles. 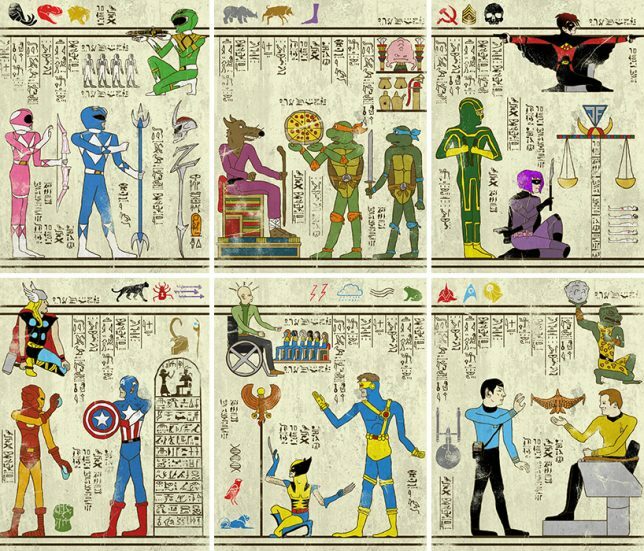 For his ‘Hero-Glyphics’ series, he dropped modern characters into poses he thought best fit each one’s personality, using background details and symbols to tell a story.